Subcellular messenger RNA localization is important in most eukaryotic cells, even in unicellular organisms like yeast for which this process has been underestimated. Microarrays are rarely used to study subcellular mRNA localization at whole-genome level, but can be adapted to that purpose. This work focuses on studying the repartition of yeast nuclear transcripts encoding mitochondrial proteins between free cytosolic polysomes and polysomes bound to the mitochondrial outer membrane. Combining biochemical fractionations with oligonucleotide array analyses permits clustering of genes on the basis of the subcellular sites of their mRNA translation. A large fraction of yeast nuclear transcripts known to encode mitochondrial proteins is found in mitochondrial outer-membrane-bound fractions. These results confirm and extend a previous analysis conducted with partial genomic microarrays. Interesting statistical relations among mRNA localization, gene origin and mRNA lengths were found: longer and older mRNAs are more prone to be localized to the vicinity of mitochondria. These observations are included in a refined model of mitochondrial protein import. Mitochondrial biogenesis requires concerted expression of the many genes whose products make up the organelle. In the absence of any clear transcriptional program, coordinated mRNA localization could be an important element of the time-course of organelle construction. We have built a 'MitoChip' localization database from our results which allows us to identify interesting genes whose mRNA localization might be essential for mitochondrial biogenesis in most eukaryotic cells. Moreover, many components of the experimental and data-analysis strategy implemented here are of general relevance in global transcription studies. Subcellular messenger RNA localization appears to be of great importance in a wide variety of biological contexts [1–4]. In this study, we focus on the subcellular localization of yeast nuclear mRNAs encoding mitochondrial proteins. We wish to show that the genome-wide approach used in this work is both useful and adaptable to addressing global mRNA localization studies. In most eukaryotic cells, mitochondrial biogenesis relies on the expression of hundreds of nuclear genes whose protein products have to be properly addressed to mitochondrial compartments in synchrony with the biogenesis program. Seven of the eight major products encoded by the yeast Saccharomyces cerevisiae mitochondrial DNA are hydrophobic subunits of respiratory complexes in the mitochondrial inner membrane. The translation of the subunits occurs on ribosomes bound to the mitochondrial inner membrane, which implies membrane-bound nuclear-encoded translation activators. Localization of the translation process in the same cellular compartment ensures synthesis of mitochondrially encoded proteins near sites of their assembly into multimeric respiratory complexes . All other mitochondrial proteins are encoded by the nuclear genome. The way these proteins are addressed to mitochondria has been studied extensively for the past three decades. Best known are the mitochondrial targeting sequence (mts), which is an amino-terminal presequence, and its interactions with the mitochondrial receptor-translocator TOM-TIM (transporter of the outer membrane - transporter of the inner membrane) [6, 7]. The steps leading to the translated precursor in its mature form, localized in the mitochondria, have been fully analyzed by in vitro experiments [8, 9]. Nevertheless, various observations suggest that this general post-translational targeting mechanism could be preceded, in vivo, by many processes. In particular, mRNA localization could guide protein translation to the vicinity of mitochondria. Thirty years ago, ribosome-binding sites were observed on yeast mitochondria . Additionally, the time lag between the completion of translation and the beginning of the import process is very short, which suggests that the two processes might be tightly connected . More recently, several studies in human and in yeast cells presented compelling evidence that some mRNAs are localized close to mitochondria in vivo [12, 13]. In previous studies we used microarray analyses to explore the mRNA targeting process . These analyses, which concerned only half of the mitochondrial 'mRNA localizome', showed that a proportion of nuclear-encoded mitochondrial transcripts are addressed to the vicinity of the mitochondrion. They are translated on polysomes associated with the outer mitochondrial membrane, which, in a way, is reminiscent of the case of the seven mRNAs encoded by the mitochondrial genome and translated on the mitochondrial inner membrane. In the study reported here we carried out a more complete analysis based on an improved purification protocol; this explored all the yeast genes. These experiments provided results for 95% of nuclear genes known to encode a mitochondrial product. This more complete dataset revealed interesting statistical relations involving mRNA localization. These relations and the generality of our micropurification/microarray (MPMA) approach are discussed. We adapted an improved micropurification procedure to obtain enriched mitochondrial fractions. The purity of these fractions in terms of presence or absence of mitochondria was routinely assessed by northern blots or by reverse transcriptase (RT)-PCR analysis using genes for mitochondrial, cytosolic and plasma membrane proteins as molecular probes (see Additional data files). However, the mitochondrial fractions thus obtained always included mRNAs from other intracellular membranes (data not shown). This is not surprising, as mitochondria and endoplasmic reticulum are known to be highly interconnected in S. cerevisiae . This was taken into account in the following analyses. After growth in galactose and RNA extraction, the amplified samples were treated according to the manufacturer's instructions. To assess mRNA quality, a quality-control was included in the protocol before amplification. Figure 1 summarizes the biological question and the experimental strategy. A microarray analysis to study the subcellular localization of mRNAs encoding mitochondrial proteins. (a) After cycloheximide blocking of translation, polysomes associated with mitochondria (MP) and free cytoplasmic polysomes (FP) were purified and the corresponding mRNA species were purified and treated for analysis (b) using high-density oligonucleotide microarrays. The total mRNA population from spheroplasts (TOT) was extracted in parallel with the two other fractions and used as a reference. (c) After normalization and signal treatment, a synthetic localization value called MFI (membrane versus free index) was calculated as indicated for each mRNA. Ninety-seven percent of the probe sets, corresponding to 96% of the genes and 94% of the mitochondrial genes, have MFI values assigned to them. 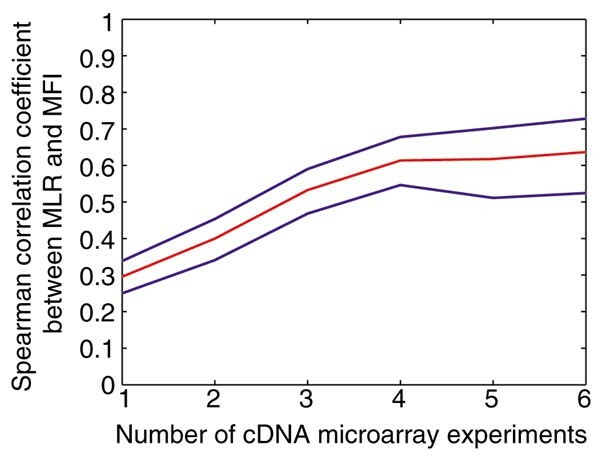 A major difficulty in studying mRNA localization with microarrays is microarray normalization. All current methods of normalizing microarray data were developed to allow between-chip comparison in transcriptome expression experiments [16, 17]. The hypotheses they rely on - the constant expression levels of most genes across experiments, for instance - do not hold true when different subcellular mRNA populations are compared. In a previous experiment, Cy5/Cy3 ratios were ranked into percentiles and averaged to compare different experiments . Diehn et al. adapted a moving-average analysis to study membrane-bound polysomes. In both cases, the method of combining results from different experiments was not straightforward and the question of the reproducibility was not readily addressed. MFIi = (log(MPi) - log(FPi))/log(TOTi) where (i = 1 or 2). The MFI1 and MFI2 values were very close, indicating good reproducibility of the whole process. Hence, the MFI1 and MFI2 values were averaged. The methodology described above, in particular the normalization procedure and the utilization of the total mRNA population (TOT), can be easily generalized to efficiently analyze larger-scale experiments involving more subcellular mRNA populations and more chips. The MFI values were compared to the 'Mitochondrial Localization of RNA' (MLR) values previously obtained from a different experimental approach. This comparison was limited to the available MLR data as the previous analysis covered only about half the genome. Despite quite different experimental designs, the comparison resulted in good correlation values, thereby validating our new approach. More precisely, previous localization values were calculated using data from one to six independent experiments. Figure 2 is a plot of the rank correlation coefficient between new values (MFI) and old values (MLR) as a function of the number of experiments included in the former. The graph includes 95% confidence intervals calculated with non-parametric bootstrap . The correlation increases quite sharply from one to four experiments, after which the curve is almost flat, with a correlation coefficient between ranks of above 0.6 from four to six experiments. This clearly demonstrates that MFIs more accurately quantify the localization than the previous MLRs. Comparison of the high-density oligonucleotide analyses (MFI) with the previous cDNA microarray analyses (MLR). A Spearman rank correlation coefficient between the MFI values obtained in this work and the previous MLR values from previous experiments was established as a function of the number of MLR experiments. The MFI experiments, which are more accurate, provide results for more than 95% of the yeast genes. Number of genes for which the MLR was calculated: one experiment, 1,268; two experiments, 632; three experiments, 412; four experiments, 247; five experiments, 110; six experiments, 94. The localization results for 97% of the probe sets, corresponding to 96% of the genes (95% of the genes encoding mitochondrial products) are available online at . Individual results or lists of results can be retrieved by ORF name, gene name or Affymetrix probe set identifier (affxid). To facilitate data interpretation, MFIs were grouped in 10 evenly divided gene classes. For instance, a mitochondrial gene belonging to MFI class 10 has its MFI among the genome's 10% highest, and hence its mRNA is much enriched in mitochondrial outer-membrane-bound polysomes. Figure 3 presents the genome-wide distribution of MFI values and highlights two lists of mitochondrial genes with extreme MFI values. 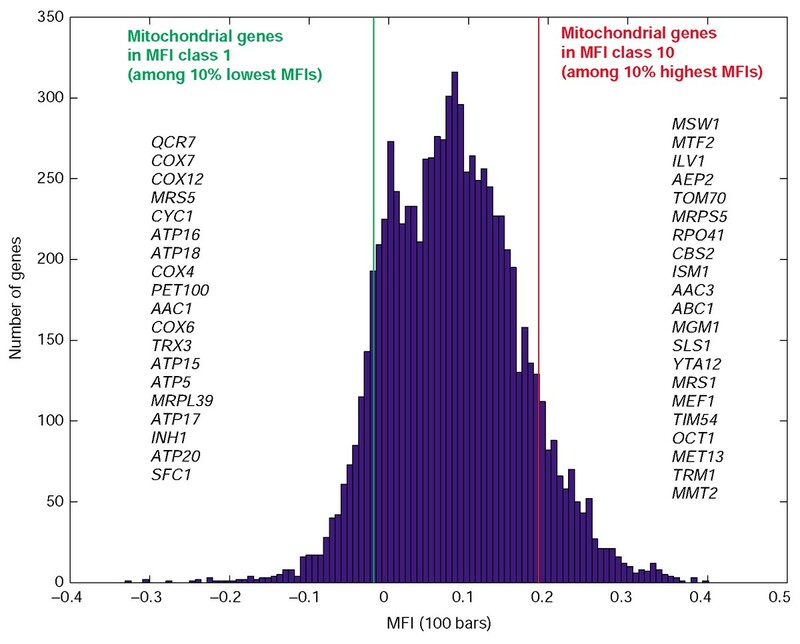 More precisely, the mitochondrial genes listed on the right of the plot have MFI values among whole-genome highest 5% (the upper half of MFI class 10) and correspond to mitochondria-localized transcripts. In contrast, the list of mitochondrial genes on the left of the plot have MFI values among whole-genome lowest 5% (the lower half of MFI class 1) and correspond to transcripts that are translated on free cytosolic polysomes. The subcellular localization of many yeast proteins is reasonably well known. We used the public database MIPS CYGD  as a reference. 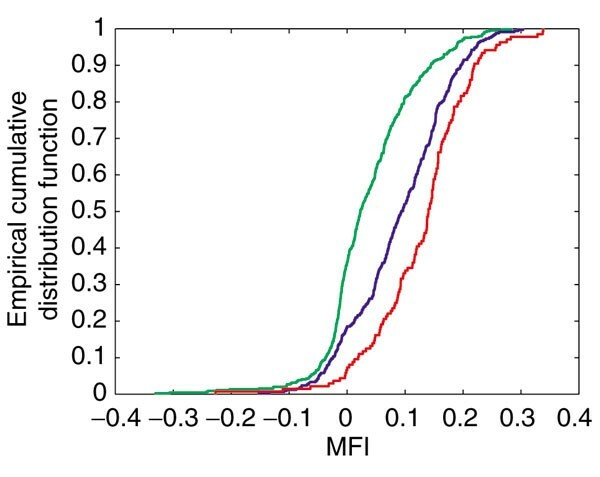 We then plotted the empirical cumulative distribution functions of the MFIs for mRNAs belonging to three separate known subcellular protein localization categories (Figure 4). As expected, genes encoding cytosolic proteins have low MFIs, whereas genes encoding plasma membrane and endoplasmic reticulum proteins have higher MFIs. If mitochondrial proteins were all translated from free cytosolic polysomes, one would expect the corresponding curve to be quite similar to that of cytosolic proteins. In contrast, the curve for mRNAs encoding mitochondrial proteins is between the two reference curves for mRNAs translated on cytosolic and on membrane-bound polysome fractions, respectively. This is the most provocative aspect of these data because it shows that a large proportion of the mRNAs coding for mitochondrial proteins is actually localized to the vicinity of mitochondria. Thus, what had been previously observed by various experimental approaches is confirmed and quantified at a genome-wide level. Whole-genome MFI distribution. Individual results for most of the yeast genes are available at . As examples, genes which are known to code for mitochondrially localized products and belonging to the two extreme 5% MFI values are listed; thus the mRNAs of genes named on the right are translated to the vicinity of mitochondria. Cumulative distribution of MFIs and protein localization. Empirical cumulative distribution functions of MFIs for mRNAs encoding proteins localized in three kinds of subcellular compartments. The left (green) and right (red) curves correspond to reference populations of 388 cytosolic and 245 plasma membrane/endoplasmic reticulum localized proteins, respectively (corresponding mRNAs are known to be translated on free cytosolic and membrane-bound polysomes). The 358 mitochondrial proteins are in the curve in the middle (blue), their mRNA localization being between that of the two reference populations. A critical point in such an approach is the procedure used to purify the mitochondria. The basic protocol used for isolation of mitochondria-associated polysomes is very similar to the previous procedure published by Butow's group . However, we previously observed  that the linear sucrose gradient step was not necessary to obtain reliable results. Accordingly our results are consistent with those previously obtained by Butow's group on a limited set of genes. However it should be emphasized that this purification protocol does not lead to pure mitochondrial fractions. 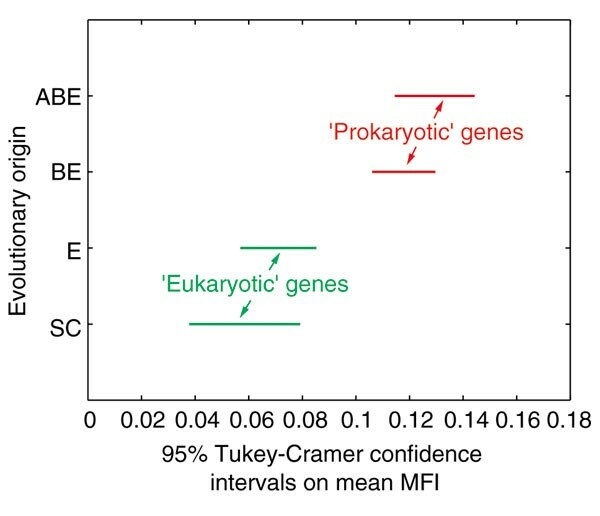 Considerable contamination by diverse membrane fractions is generally considered unavoidable; nevertheless these contaminants do not affect the general conclusion drawn from the results of Figure 3: the nuclear genes known to code for mitochondrially localized products are represented in the two extreme values of the MFI curve. Our extensive global study shows that more than 88 genes coding for mitochondrial products exhibit an MFI value over 0.15. This means that the corresponding mRNA are, in normal growth conditions in galactose, more prone to be in found in polysomes associated with mitochondria. We addressed the specific features shared by this important mRNA class. It should be kept in mind that for the six cases we examined, the 3' untranslated region (3' UTR) sequence of these mRNAs contains the mitochondrial addressing information that can target, in vivo, a tagged version of this RNA fragment . Significantly, this in vivo targeting process did not require any translational activity as it was observed with non-translatable RNAs produced by RNA polymerase III. If this observation might be extended to the whole class of mRNAs that are translocated to the vicinity of mitochondria, it does not explain the raison d'être of this targeting process. To address this question we systematically analyzed the influence of several other parameters on mRNA localization (codon bias, codon adaptation index, amino-acid content, presence and length of the mitochondrial presequence as predicted by mitoprot or targetP, intra-mitochondrial protein localization, 3' UTR M-FOLD structure, and so on). Two characteristics - the phylogenetic origin and the length of the genes - turned out to correlate with the mRNA localization properties. By making batches of alignments, Karlberg et al. classified the yeast mitochondrial proteome on the basis of each gene's evolutionary origin. The main categories they considered were: ABE (yeast genes having at least one homolog in Archaea, one homolog in Bacteria and one homolog in the eukaryotes); BE (at least one homolog in both a bacterium and a eukaryote); E (at least one homolog in a eukaryote); and SC (genes specific to S. cerevisiae). They concluded that the yeast mitochondrial proteome has a dual origin, around half of it having originated from the endosymbiont genome, while the other part evolved from the nuclear genome. Our previous study had shown that there was indeed a link between the eukaryotic/prokaryotic origin of a mitochondrial gene and the localization of the corresponding transcript. We found a statistically significant relation when we applied a one-way analysis of variance (ANOVA) to explain 358 MFI values by four categorical evolutionary origin values. To further characterize this relation, a multiple comparison among the four groups was done. Figure 5 highlights the results of that more detailed analysis, with 99% confidence intervals for each category's mean MFI. This reveals significant and ordered differences, with (ABE, BE) having more mitochondrial-membrane-localized translation than (E, SC). Although the results are not amenable to experimental test, this statistical observation might help in better understanding the cooperation between the nuclear and the organellar genomes. Interestingly, like the few remaining mitochondrially encoded genes translated near the inner membrane, the nuclear genes coming from the mitochondrial genome tend to be translated in the vicinity of the outer mitochondrial membrane. Relationship between phylogenetic categories of genes coding for mitochondrial proteins and their MFI values. Mitochondrial proteins were previously grouped into four classes corresponding to: SC, 56 genes specific to S. cerevisiae; E, 115 genes with homologs in eucaryotes exclusively; BE, 80 genes with homologs in bacteria and eucaryotes; ABE, 100 genes with homologs in archaea, bacteria and eucaryotes. Genes of prokaryotic origin are in red, and those of eukaryotic origin in green. Bars are Tukey-Cramer 99% confidence intervals. This graph shows a very significant effect of the prokaryotic/eukaryotic origin of genes on the MFI of their mRNAs. 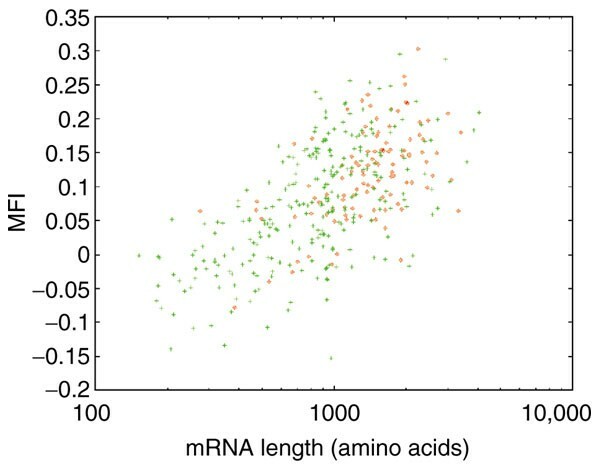 Concerning the length of the proteins, which in yeast is closely connected to the length of the mRNA, we found a surprising statistical relation between mRNA length and mRNA localization; longer mRNAs tend to be localized to the vicinity of mitochondria (correlation coefficient: 0.67; see Figure 6). Mitochondrial mRNA localization and mRNA length. The MFI values of 358 genes known to have mitochondrially localized products are plotted against the corresponding mRNA length (semi-log scale). The Pearson correlation coefficient between MFIs and log mRNA length is 0.67. The red dots correspond to genes of prokaryotic origin (ABE in Figure 5). The higher number of nascent polypeptide-chain-associated complexes (NAC) found on the longer mRNAs could attract the corresponding polysomes to the vicinity of mitochondria (see text for details). George et al. recently proposed a molecular mechanism and a model for the coupling of translation and translocation of mitochondrial mRNAs in vivo. Their model is based on the experimental observation that the nascent-polypeptide-associated complex (NAC) promotes interaction of the ribosome with the mitochondrial surface in vivo. Lithgow's two-step model proposes that in an early phase most mitochondrial mRNAs begin to be translated in the cytosol, whereas in the late phase, when a ribosome eventually encounters the surface of a mitochondrion, the mRNA molecule remains 'stuck' to the mitochondrion until its translation is completed. On average, longer mRNAs have more ribosome-NAC complexes, which results in a higher affinity for mitochondrial outer membrane. Interestingly, in a quite different context, flock-house virus mRNA polymerase is translated on Drosophila mitochondria while its amino-terminal sequence is inserted into the mitochondrial membrane . That example shows that the existence of a mitochondrial targeting sequence (mts) and a mitochondria-localized mRNA is not contradictory. In addition to the coordinated action of NAC and mts, in vivo RNA targeting analyses have shown that the 3' UTR contains sufficient information to address the corresponding RNA to the vicinity of mitochondria . This means that several mechanisms can control the mRNA targeting process. Some of these are essential; for instance, we recently obtained direct evidence for the genes ATP2 and ATM1 that the 3' UTR sequence is necessary for functional mitochondria. This suggests that, in the case of these two genes, the mRNA targeting process linked to the 3' UTR signal is required for mitochondrial biogenesis . In addition, the initiation of translation of many mRNAs is, at least in part, controlled by their 3' UTR structure. Thus, early translation cis (mts, 3' UTR) and trans (NAC) factors act synergistically to control the targeting of many mRNAs coding for mitochondrial products. It has recently been demonstrated that ribosomes can 'sense' features of nascent polypeptide chains and modulate translation accordingly. 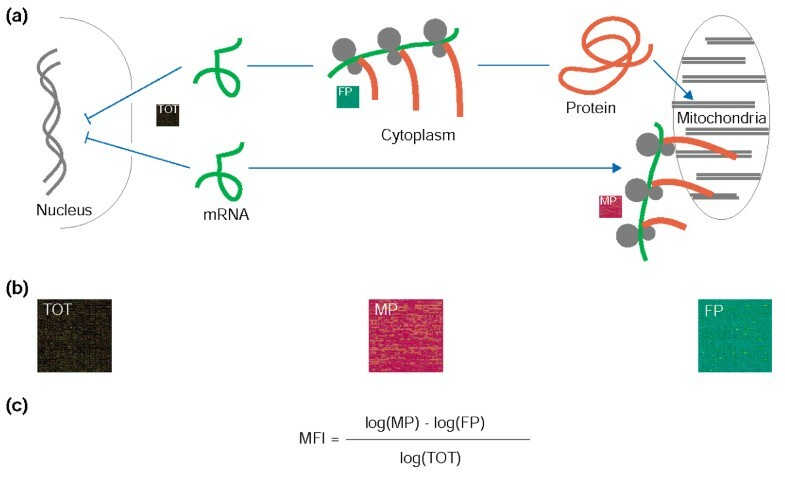 Our results suggest that the mts and the 3' UTR could be such features that control mRNA translation in connection with the mitochondrial import process . What could be the role of the mRNA targeting process in the biogenesis of mitochondria? Our favourite hypothesis is to imagine that it might be part of the control of the time course of production of mitochondrial proteins. One can reasonably propose that assembly of large mitochondrial complexes requires a temporally controlled import of the different subunits. Our observation would imply that the largest subunits are more likely to be the basic elements of the architecture of the mitochondrial complexes. This assumption should be amenable to experimental assessment. This mitochondrial mRNA targeting process is not specific to S. cerevisiae. Several studies in various human cells have shown that some specific mRNAs can be found next to mitochondria [27, 28], which strongly suggests that our observation can be applied to many organisms. This study shows that a combination of subcellular fractionation, high-density oligonucleotide arrays and an appropriate data-analysis strategy can reveal subcellular mRNA localization at a genome-wide level. Such approaches, which rely on biochemical purification, require rigorous independent controls, as it can be problematic to distinguish between mRNAs associated with mitochondria and with other cellular membranes. In the case of yeast mitochondrial fractions, which always co-purified with endoplasmic reticulum membranes, we checked, by in vivo experiments, that several mRNAs coding for mitochondrially localized proteins are actually addressed to the vicinity of mitochondria . The global analysis presented here, which is based on oligonucleotide arrays, describes two subcellular localizations for mRNAs from which mitochondrially localized proteins are translated. Such a dual localization is clearly independent of the biochemical contaminants of mitochondrial fractions. This confirms and extends our previous study  showing that mRNAs of prokaryotic origin are preferentially localized to the vicinity of mitochondria. Moreover, this new analysis shows an unexpected relationship between mRNA length and localization. It looks as if the primitive mRNA mitochondrial targeting process has been predominantly conserved for longer mRNAs, a feature that might be connected with the mitochondrial biogenesis program. The 'MitoChip' database we compiled, and which is available online ( and Additional data files), should help in designing new experiments, on a gene-by-gene basis, to test and refine this model. We are currently generalizing this kind of mRNA localization analysis to other types of cells and subcellular fractions. Saccharomyces cerevisiae strain CW04 (isonuclear to W303-1B: MATa, leu2-3, ura3-1, trp1-1, ade1-2, his3-11, can1-100) was used. Yeast was grown in a galactose-rich medium (1% bacto-yeast extract, 1% bactopeptone, 0.1% KH2PO4, 0.12% (NH4)2SO4, 2% galactose). Mitochondria-bound polysomes and free cytoplasmic polysomes were purified as described by Ades and Butow , with few modifications. To convert cells to spheroplasts, they were treated for 60 min with Quantazyme (1,000 U per g per wet weight cells) (Quantum Appligene, Illkirch, France) at 30°C with shaking. Spheroplasts were allowed to regenerate for 3 h with gentle shaking at 28°C in 1 M sorbitol, 1% bactopeptone, 1% yeast extract, 0.1% KH2PO4, 0.12% (NH4)2SO4 and 2% galacotose. Regeneration was stopped by adding cycloheximide to a concentration of 300 μ/ml and 20 min later the culture was poured over frozen 1 M sorbitol, 200 μ/ml cycloheximide. The spheroplasts were harvested and washed with 1 M sorbitol, 200 μ/ml cycloheximide. One-twentieth of the spheroplast volume was frozen at -80°C. The rest of the spheroplasts were homogenized in 6 ml of the following breaking buffer: 0.6 M mannitol, 30 mM Tris-HCl pH 7.4, 100 mM KCl, 5 mM magnesium acetate, 5 mM 2-mercaptoethanol, 200 μ/ml cycloheximide, 2,000 U/g yeast protease inhibitor cocktail (Sigma) 10,000 units RNAsin ribonuclease inhibitor (Promega, Madison, WI) and 500 μ/ml heparin. Cells were disrupted with 15 strokes using a glass Teflon pestle. The homogenate was centrifuged at 4,500 rpm for 10 min; the pellet was once again disrupted and centrifuged. Both homogenates were combined and centrifuged twice to eliminate unbroken cells and nuclei. The resulting supernatant was further centrifuged at 11,000 rpm for 30 min. The pellet of crude mitochondria associated with polysomes was washed twice in mannitol-polysome buffer before storage at -80°C. Free cytoplasmic polysomes were purified from the post-mitochondrial supernatant by sedimentation through a step gradient of 2 M and 0.5 M sucrose, each of these solutions prepared in 30 mM Tris-HCl pH 7.4, 100 mM KCl, 5 mM magnesium acetate, 5 mM 2-mercaptoethanol, 200 μ/ml cycloheximide, 600 U/g yeast protease inhibitor cocktail (Sigma) 2,500 units RNAsin ribonuclease inhibitor (Promega) and 500 μ/ml heparin. The gradients were centrifuged at 40,000 rpm for 20 h at 4°C using the TST41 Ti rotor. The pellet, containing free cytoplasmic polysomes, was used for RNA extraction. RNA was extracted from spheroplasts, mitochondria-bound polysomes and free cytoplasmic polysomes using the RNeasy Protect MIDI kit (Qiagen, Valencia, CA). Detailed information on this aspect of the experiments can be found in Additional data files and at  All the raw-values and pictures (.cel and .dat files) are available for download. For each of the six arrays, mRNA quality was controlled (Agilent Bioanalyzer; Agilent, Palo Alto, CA) before hybridization. Data analysis was carried out using the Affy Package (L. Gautier and R. Izarry, unpublished), which is part of Bioconductor R bundle. Classical normalization procedures, built on the assumption that most genes expression values do not vary across arrays, could not be applied for all six arrays. Therefore, arrays were normalized on a pairwise basis using the Bolstad method: MP1 with MP2; FP1 with FP2 and TOT1with TOT2. The Bolstad method averages independently perfect match and mismatch signal intensity values among chips at each quantile level, which reshapes the entire intensity distributions to make them comparable. Quantile normalization tends to align intensity boxplots and flatten MvA plots. We then checked whether spike mRNAs gave similar results for the six chips; as this was almost the case, no further correction was applied. Expression values were then computed using Affymetrix's playerout algorithm. Genes (3% of total) that had at least one of the six intensity values under an arbitrary threshold were discarded from further analysis. Interestingly, when conducted with MAS5.0, the analysis gave the same kinds of results, but with larger variability. We used standard one-way analysis of variance. Multiple comparison analysis was then applied using the Tukey-Kramer test with α = 1%. This test is known to be somewhat conservative for unequally sized subpopulations. The Bonferroni test gave the same results (ABE, BE) > (E, SC). Additional data files available and from  comprise supplementary figures showing: the effect of quantile normalization on MvA plots and boxplots of log-intensities (Additional data file 1); log-intensities for spike mRNAs (Additional data file 2); MFI for replicate 1 (chips MP1, FP1, TOT1) versus MFI for replicate 2 (chips MP2, FP2, TOT2) (Additional data file 3); ANOVA results (Additional data files 4 and 5); comparison of the length of genes coding for mitochondrial proteins and cytoplasmic proteins in yeast (Additional data file 6); analysis of the quality of RNA purified from the two polysomal preparations examined (Additional data file 7); figure legends and titles (Additional data file 8), and a full dump of the online database (Additional data files 9 and 10). Each row of the database is composed of the following columns: Gene Name, ORF, Affymetrix Id, MFI Value and MIPS Localization. We thank J.J. Daudin, L. Gautier and P. Marc for helpful discussions and comments on the manuscripts. This project was supported by grants from the Ministère de la Recherche and AFM (MNM 2000).